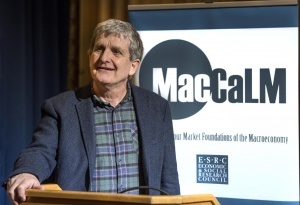 In March, MacCaLM Principal Investigator, John Moore, took part in the School of Economics’ first ‘An Evening with’ series. Moore presented his paper ‘Evil is the Root of all Money’ to 180 staff and students. Below is an article written by economics student, Stian Sanderg. 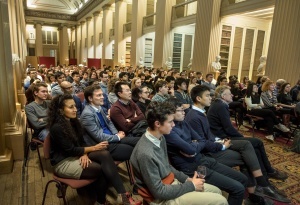 In celebration of the Edinburgh School of Economics’ 10-year anniversary, a series of events called ‘an evening with’ was launched, where prominent members of the school give special lectures to economics students at Edinburgh. To kick-start this series off, the first speaker was none other than renowned economist John Moore. 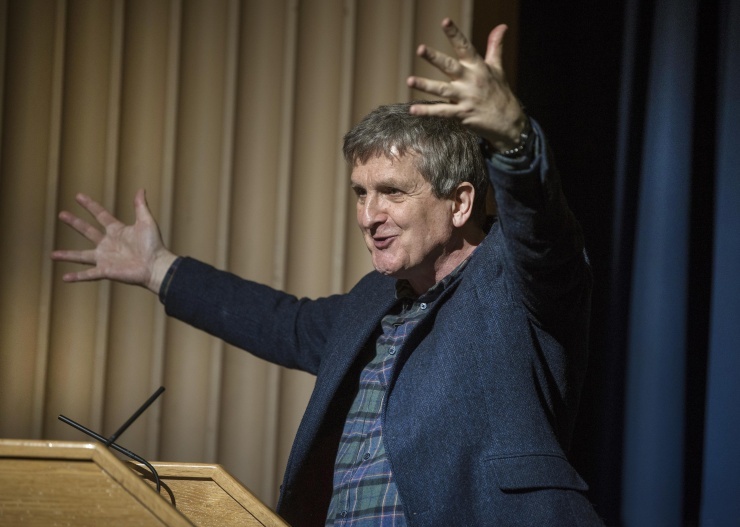 John Moore’s lecture titled ‘Evil is the Root of all Money’, was never previously given to students at Edinburgh and showcases one of Moore’s unpublished ideas that he developed in the early 2000’s alongside his colleague Nobuhiro Kiyotaki at the London School of Economics. Moore began by questioning a concept that we, as consumers or producers, might take entirely for granted, but nevertheless poses several interesting economic questions: money. What is the point of money? For an economist, money seems like a redundant tool to facilitate trade, as classical theories praise the role of perfect competition. In such a world, money is simply not necessary, as every trade happens perfectly without any frictions. The real world, however, does not always work like this and no economics degree is required to draw this conclusion. it, is characterised as the lack of trust, and thus money emerges as a driving force in the economy in order to facilitate the situation The dentist would never be able to use the paper I issue her to purchase new goods and services, because who would ever trust me to pay her back? If she then gave that paper to the man who sells her shoes, he would proceed to laugh in her face. He would, however, trust the bank and thus money emerges as a by-product of evil. Moore illustrated this concept via the cunning use of different coloured arrows, going up and down in an aeroplane like fashion. He asked us to view the problem in a simplified manner, spanning three days and three different agents: the principal, the provost, and the professor. These three agents all have investment projects that take off one day, and lands two days later with more money than when it took off. What is nice about this trio of eager entrepreneurs, is that one project always lands when another project takes flight, meaning in theory funds are always available for use. But the issue still remains that none of these agents trust each other, so they cannot be certain that they will get their money back. They can, however, assume that the first project has some sort of collateral value; some physical assets that could be sold should the project fail. This means that a central actor can commit to paying back the loan even in the event of a failure, and thus emerges what can be thought of as a banker. This banker facilities trust within the economy and allows the ‘blood’ to flow. economy, it is no wonder we find ourselves in situations like the Great Recession. As this issue of Insight has presented, change is prominent throughout the economy, but one thing remains constant as well: human beings. 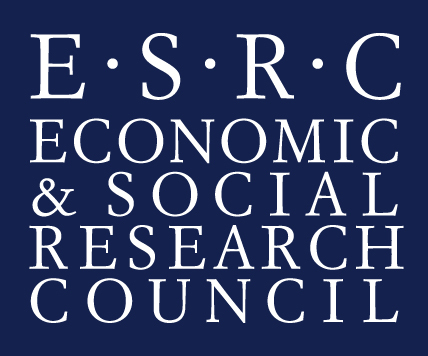 If a lack of trust is causing the flow of money through the economy, then perhaps recessions like the 2008 financial crisis are not rare events, but a natural externality expected to occur. Whether you are a first-year undergraduate student, or a fourth-year considering postgraduate education, Moore’s lecture provided insights into a matter often overlooked in classical economics lectures. It sure helps that Moore is the kind of speaker that can make any topic interesting, and his words were a worthy start to the celebration of the School of Economics’ 10-year anniversary. – This article was written by Economics student, Stian Sanderg and appears in the student-run Insight Magazine.